PA leadership blasts U.S. decision to open its embassy in Jerusalem to coincide with Israel’s 70th Independence Day. The Palestinian Authority (PA) leadership on Friday blasted the U.S. decision to open its embassy in Jerusalem in May, coinciding with Israel’s 70th Independence Day, saying it was "a provocation to Arabs". "The American administration's decisions to recognize Jerusalem as Israel's capital and choose the Palestinian people's Nakba as the date for this step is a blatant violation of international law," senior Palestine Liberation Organization (PLO) official Saeb Erekat told AFP. The Arabs refer to Israel’s founding as the Nakba, or "catastrophe." 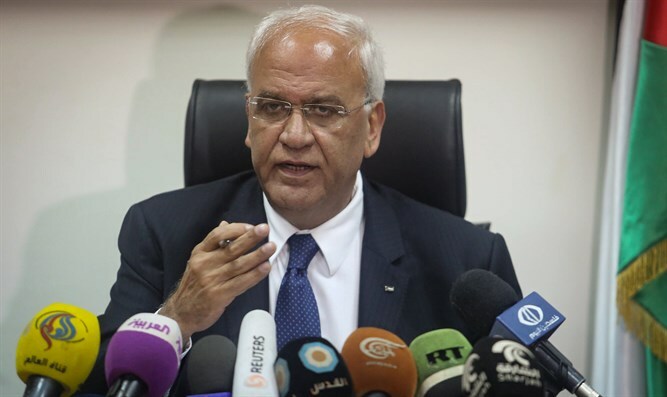 Erekat warned that the result of the American move would be "the destruction of the two-state option, as well as a blatant provocation to all Arabs and Muslims." Nabil Abu Rudeineh, a spokesman for PA chairman Mahmoud Abbas, said, according to Reuters, “This is an unacceptable step. Any unilateral move will not give legitimacy to anyone and will be an obstacle to any effort to create peace in the region. The Hamas terrorist organization, which rules Gaza, also condemned the American decision. “Moving the U.S. Embassy to Jerusalem is a declaration of war against the Arab and Muslim nation, and the U.S administration must reconsider its move,” said the group’s spokesman, Sami Abu Zuhri. Earlier on Friday, a senior State Department official said Secretary of State Rex Tillerson had approved a security plan late Thursday for an embassy location to open in Jerusalem. The embassy would be in an annex of an existing U.S. facility in the neighborhood of Arnona. Moving the American embassy from Tel Aviv to Jerusalem was a central campaign promise of President Donald Trump’s. In December, he announced that he recognized Jerusalem as Israel’s capital and ordered the State Department to begin preparations for the embassy move.